Basic configuration is quite simple and similar to OSPF configuration described before. For purpose of this part of lab Ethernet connection between R2 and R3 is disabled and Serial connection is introduced using Serial2/3 interface configured. This link will be VRF_C member. We advertise loopback only on R10. Now the PE part. 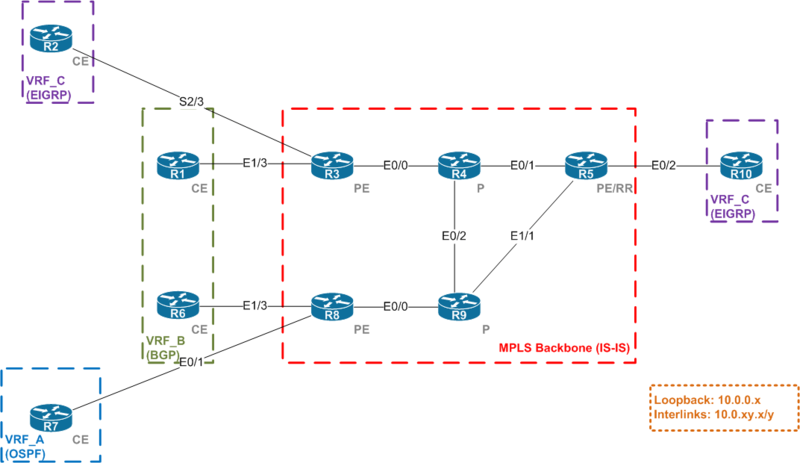 As in OSPF we have to remember to redistribute between BGP and EIGRP. The customer EIGRP AS number is defined for particular VRF under address-family section.